Over the weekend we had out two groups on the Lehigh. Ray, Paul, Joe and Greg all had afternoon/eve wade trips. Water levels are still conducive for wade fishing and water temps are now dropping. Bug activity was fair for fall conditions - but varied greatly between location fished. We had hatches of slate drakes, BWOs and some summer sulphurs still. In one location just prior to dark there were enough sulphurs to bring up a few fish and in the other location there were some slate drake spinners and a good BWO spinner fall. 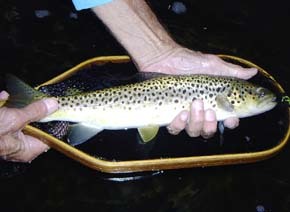 Problem is the BWOs are very tiny, size 24 and most of the time Lehigh trout would rather feed on something with more bang for the buck. Totals for the afternoon include Paul landing 2 browns, one going 16" and also a big rainbow that also went 16". Joe got a dink smallie and was schooled by a big rainbow that took a stonefly nymph in a heavy run. Ray had some good shots but the fish were a little short on the take and Greg got one small trout on a nymph - he missed a few other as well..
All together, the fishing is picking up but the fish still seem to be in isolated locations and have not really spread out yet. Hopefully we get some rain to spread the fish out and weather pending we will be able to get the clack back on the river before the year is out. Prime Lehigh River nymphing water. 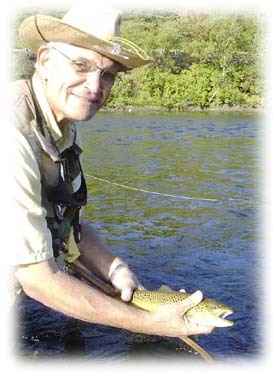 Paul with a nicely colored Lehigh River brownie. September 24, 2005 - SALT! It is time to grab the korkers, and hi-tail-it to the salt! It is starting to bust wide open. Action was fantastic last weekend, and from what we hear, there are larger fishing beginning to cruise the wash! Now till Christmas is the time to hit it. We still have openings for our Fall Blitz Package. Check it out! Many don't know it, but we have a world-class fishery right at our doorstep. Email us for more info. Hooked-upwith a blue on the rocks. Always an adventure! Finally, the fishing is picking up on the Lehigh. Look for isos, olives, caddis, summer sulphurs and a few BIG stoneflys here and there. You won't find a lot of each bug, but if you lump them all together, you have rising fish. The fish are looking up, so concentrate on using drys. This is all good to see, especially after the summer we've had. 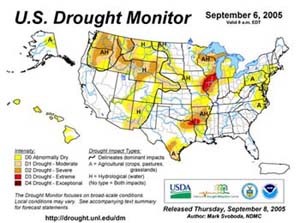 Water temps soared into the 80s for many days on end, and flows offered little relief at all. Evenings are your best bet and wading opportunities are a plenty on this big river. Shoot us an email if this interests you. Lehigh River brownie taken off the top. As we leave summer behind, and look toward October on the Lehigh we begin to see the trees and those Lehigh River browns show their true colors! Hopefully this summer's low water and above normal water temps did not beat up on the trout too much. Look for little blue winged olives, small caddis and a few slate drakes in the beginning of the month. As always streamers and wooly buggers are effective in the fall. The Lehigh River Stocking Association (LRSA) will be doing its fall fingerling stocking. The LRSA puts in thousands of 6-7" brown trout fingerlings that are usually 10-12" by April. If smallmouth bass are your target species, these feisty fish should be putting on the feed bags big time. Indian summer days always seem to be the best days to fish the river so get out and enjoy October's splendor, the fishing will just be a bonus. Everything is low right now - especially so here in Eastern PA! Beltzville is releasing water for lo-flow augmentation - releases are about 90cfs. Release temps have hit 60F in the afternoon, which is warm - relatively speaking - for the Po. This is a great level though for this stream! Blue Marsh is also releasing - release temps are in the 70s!!!! The Tully is officially outta cold water! Click here for the Tully. New for 2005 is our Fall Blitz Package. This is a perfect oppotunitity to learn about fly fishing the salt. We take care of all the logistics! If you want to catch bass and blues on the fly, then this is the trip you have been looking for. Bookings are done thru TCO Fly Shop. For any questions, email us at info@flyfishpa.net. 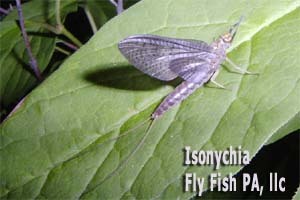 Now is the time of year where we see the last cycle of mayflies, which will wrap up the season. One of our favorites is the Isonychia. Most of the time these mayflies will emerge onto midstream rocks and along the banks, which can be easily seen due to the leftover shucks. But they can also emerge mid-river. In the nymph stage they are extremely effective swimmers, and can really dart about. The trout know this to, since they can feed aggressively on the nymph stage. 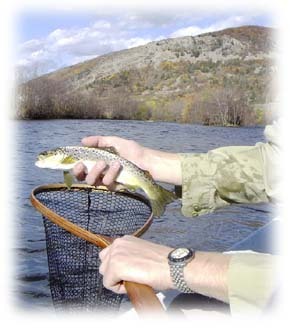 Letting a nymph swing thru the riffs or paring with a dry as a tamden rig can be an effective method of fishing. Look for these bugs on just about all of our freestoners.